Contrary to what you might have heard in the past, coming up with a concept for a business is not about arriving at a “big idea,” it’s about creating a solution to a problem you or those around you have experienced. Preferably, it’s a problem/solution set that’s big enough people will pay you to solve it. If you haven’t read Paul Graham’s essay titled, “How to Get Startup Ideas,” I highly recommend taking a look after this post. While this is terrible advice for children, it’s some of the most important advice for aspiring entrepreneurs. One of the best exercises you can go through as you initially validate an idea is to go out in public and interview people who would be your potential customers. There’s no other way to get feedback on your concept initially, and the one thing that’s way more uncomfortable than talking to strangers about an idea is spending 100’s of hours building that idea, to only find out no one wants it. One of the best pieces of advice I received for discussing a new concept with people is to introduce yourself as someone consulting on this new business, not as the founder of the new business. If people think you are the founder, they will be nice. If they think you’re a consultant, they’ll be honest. This is a difficult lesson to learn because this concept is probably near and dear to your heart, but I promise, getting honest feedback from your potential customers is the most invaluable thing you can get at this stage. This concept is so incredibly important because building for these passionate people will be the best influence on what direction you take your product/service early on. Not to mention, people pay for something they love, whereas they will not continue to pay for something they “kind of like,” long-term. If you’re going to build a sustainable business, you’re going to need long-term customers. Another note on analyzing interview responses is to balance the Henry Ford adage of: “If I had asked people what they wanted, they would have said faster horses” with, “Live in the future, then build what's missing” (a hybrid quote brought about by none other than, Paul Graham). It’s important to remember that concepts like Facebook, Uber, and Google weren’t literally explained to their founders by potential customers or users, but they were deliberate solutions to problems that were expressed by those interviewees. For Facebook, there was a deep human desire to be connected, and remain connected, to other humans. For Uber, taxis had become a necessary evil, mostly due to a monolithic taxi industry that was disincentivizing drivers to give good service. For Google, the internet was a mostly useless tool for people who didn’t know how to manage or index it. In each one of these examples the founders imagined the future of these concepts and built what was missing. A people connector, a ride with a good experience, and a search engine. Acquiring users through advertising channels and activating or converting them shows real validation. Lucky for you, you can accomplish this with a conceptual product or service, a web page, and a bit of elbow grease. Rick Martinez, the owner of Senor Sangria, a manufacturer of ready-to-serve, bottled sangria validated his product by asking retailers to try it. That simple. "To validate, I made some of my homemade sangria and I took it to a few retailers and asked them if they would buy a sangria in a bottle that tasted like this. Each of them said if I could bottle my homemade stuff they’d buy it. They all seemed to really enjoy my sangria but didn’t think I’d be able to do it on a commercial scale. Alex Brola, co-founder and president of CheckMaid.com, which runs an online on-demand cleaning service stood up a web page to gauge interest before he even created the service. Once you’ve followed steps to arriving at a concept that solves a real problem and you’re fairly certain folks will pay something for it, it’s time to start understanding how you acquire new customers and if you can do so repeatedly. Acquisition - How do users find you? Activation - Do users have a great first experience? Retention - Do users come back? Revenue - How do you make money? Referral - Do customers tell other users about you? For the sake of this post, we’ll mostly focus on acquisition, activation, and revenue. Understanding retention and referral, in most cases, is something we would look at after we have a number of customer use cases under our belts. Views: The number of total pageviews that occured on your site in a given period. Ie. if one visitor clicks through to 5 pages, that will count as 5 views. It’s often helpful to look at a Views/Visits ratio to understand how engaged unique visitors are with your content. If you have a high Views/Visit ratio, it means that visitors, on average, are engaged with what content you have produced and are intrigued and able to navigate from page to page. After understanding general engagement and audience count, it’s important to breakdown where your audience is coming from. For that we’ll look at traffic broken down by device, source, and location. Traffic by Device: Are people visiting our site from mobile, desktop, tablet, etc? Traffic by Source: What channels are we effectively attracting traffic from? Social? Referral links? Email? Traffic by Location: Where in the world do our visitors come from? Understanding these traffic demographics will help you to hone messaging and optimize certain channels over others. For example, if you see that almost no traffic comes from mobile, you might not want to worry too much about optimizing your website for mobile in the early days. Conversely, if you have a consumer-facing model and see that you’re getting a majority of your visits from mobile, you need to make sure the site looks great and is easy to navigate from popular phones. After you have a good idea of who your audience is, it’s time to optimize how you convert them to users and customers. Visits/Lead Conversion: What percentage of our visitors are performing a desired action like email signup, white paper download, or a purchase? 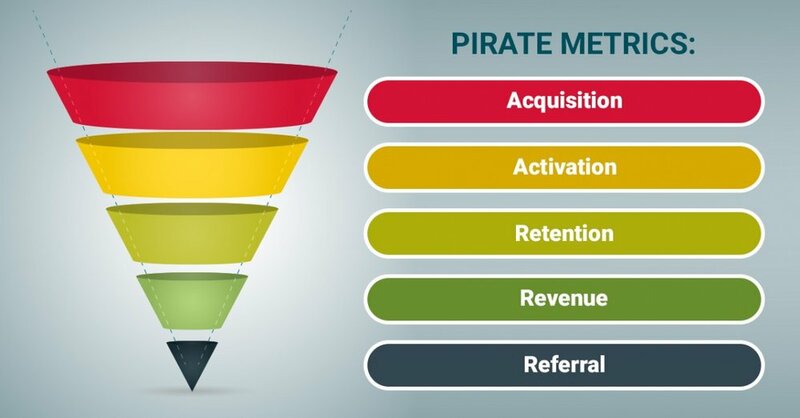 Conversion funnel: What steps are taken by a visitor to complete a conversion goal? What are sticking points for people? Are visitors clicking on “sign up” but falling off during registration? How can we improve that process? Conversions by campaign: Which of our marketing campaigns is producing the highest conversions? Is email proving more effective than Google ads? What do we do to grow our email subscribers? Conversions by page: Do certain pages drive more conversions than others? How do we drive more traffic to those pages? How do we use similar messaging or ideas across the rest of our website? So now we have folks raising their hands to say they want what we’re selling, how do we optimize for real, paying customers? Especially in businesses that require some personal touch before converting leads to customers, you’ll need to track certain metrics to measure the efficacy of this process across your organization, but also on an individual level. Lead/Trial Conversion: What percentage of our leads are we converting to sales? Are certain messages or approaches better at converting to sales than others? Time from First Contact to Sale: From the first time we connected with this person, how long did it take them to pay us? What is our sales cycle? If our contract value is low, this needs to be fast. If we are selling large contracts, we can afford to take our time here. Customer demographics: What demographic or type of people are converting to the best customers? What types of accounts close faster? What types pay the most money? These are just a few metrics that are helpful for validating your business concept in the early days, but there are many others that might be more specific to your niche. It’s also important to note that you can go too far with data analysis. Especially while you only have a few visits, users, and customers, you need to stay conscious of what is statistically relevant or not. At the early stages the numbers that should influence your decisions will be reasonably dramatic. Don’t make major product decisions after single-digit percentage points of people act a certain way, and make sure you’re aware of all possible variables that might lead to an outcome. For example, if an email doesn’t perform well, a number of factors can be to blame like subject line, messaging, length of message, time of day sent, demographic sent, reason for sending, etc. While these metrics will be incredibly helpful to understanding if what you’ve built is what people want, it’s vitally important to balance this with talking to your customers mixing in a subjective opinion with the objective data you collect. Ready to Validate Your Concept? Try Our Concept Validation Dashboard for Free.